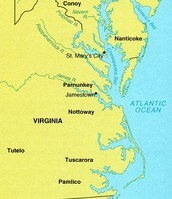 The Colony of Virginia was the first English Colony in the world. The colony existed briefly during the 16th century, and then continuously from 1607 until the American Revolution - as a British colony after 1707. The name Virginia was first applied by Sir Walter Raleigh and Queen Elizabeth I in 1584. After the English Civil War in the mid 17th century, the Virginia Colony was nicknamed "The Old Dominion" by King Charles II for its perceived loyalty to the English monarchy during the era of the Commonwealth of England. In 1607, members of a joint venture called the Virginia Company founded Jamestown, the first permanent English settlement in North America on the banks of the James River. Famine, disease and conflict with local Native American tribes (the Powhatan Tribe) in the first two years brought Jamestown to the brink of failure before the arrival of a new group of settlers and supplies in 1610. Named for Queen Elizabeth I of England (known as the Virgin Queen). Here is an aerial view of the capital of Jamestown. It looks quite cozy. This image shows where Jamestown is on a map and what is around it. 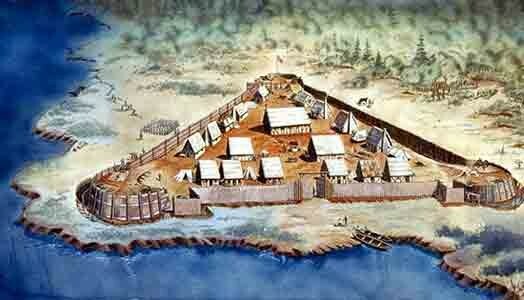 It is said that the Virginia Company settled Jamestown to find gold. What is so special about Virginia? Tobacco became Virginia's first profitable export, the production of which had a significant impact on the society and settlement patterns. Yes, you read that correctly... we have Tobacco. Bacon's Rebellion- Bacon's Rebellion was an armed rebellion in 1676 by Virginia settlers led by Nathaniel Bacon against the rule of Governor William Berkeley. The colony's disorganized frontier political structure, combined with accumulating grievances (including leaving Bacon out of his inner circle, refusing to allow Bacon to be a part of his fur trade with the Native Americans, Indian attacks), helped to motivate a popular uprising against Berkeley, who had failed to address the demands of the colonists regarding their safety. About a thousand Virginians of all classes rose up in arms against Berkeley, attacking Native Americans, chasing Berkeley from Jamestown, Virginia, and ultimately torching the capital. The rebellion was first suppressed by a few armed merchant ships from London whose captains sided with Berkeley and the loyalists. Government forces from England arrived soon after and spent several years defeating pockets of resistance and reforming the colonial government to one more directly under royal control. What impact does location have? Well, for started Virginia is a Coastal Colony just like some others out of the original 13 colonies. This means that it is convenient to the sea and you are able to get things sent to you by ship from England. That is actually quite convenient. This also means that Virginia could become more open for trade with outsiders, even people across the world. The colonial government that Virginia has is ran by the House of Burgesses which was the first legislative body in America giving settlers the opportunity to control their own government. The trade that pertains to Virginia is Tobacco and Glass Artifacts. After receiving Tobacco seeds from Europe, Virginians began to export Tobacco to everyone. The Glass Artifacts were traded among themselves. Religion and politics are intimately linked in Colonial Virginia. The Church of England practiced a form of Protestant Christianity that in some ways resembled Catholicism. Virginia is a Royal Colony that was started by the Virginia Colony in hopes of discovering gold. Virginia is a colony of prosperity and openness. Virginia is waiting for new residents and people who would love to call this lovely land their home. Virginia is a quite, peaceful place that anyone could enjoy. There are many opportunities for trade and growth of a business. We look forward to you coming to Virginia!